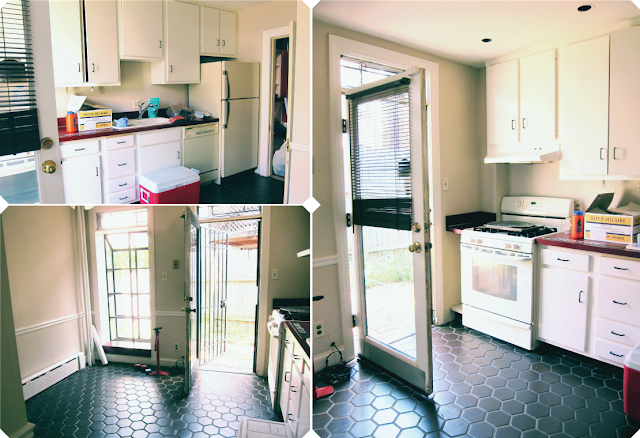 so this week, it's on to our kitchen. i'd say it's likely the most *done* spot in the house. with the exception of the electrical outlets needing to be replaced, and well, the dream of wanting to turn that whole back wall into giant glass sliding doors. also, if i can ever get my hands on a larger sized smeg, well, then we'll have to get a new fridge. gross appliances that smelled of ketchup and cigarettes, tile floor with grout that matched the tile. oh wait, no, that was years and years of caked up grease and shoe dirt. fallen crumbs crushed one after the next into the floor. cigarette ashes fallen. and god only knows what else. it was DISGUSTING. the kind of disgusting that makes you want to vomit when cleaning. the kind of disgusting that takes two people seven hours and several wire brushes to clean. so um, yeah, it's kind of a light grey/neutral colored grout. red countertops. the lady who used to live here, she really liked red. also a ceiling fan. which in retrospect, kind of a good idea. but whatever. when we took it down we found a good inch of crap and dust on every last one of those fan blades. again, GROSS. 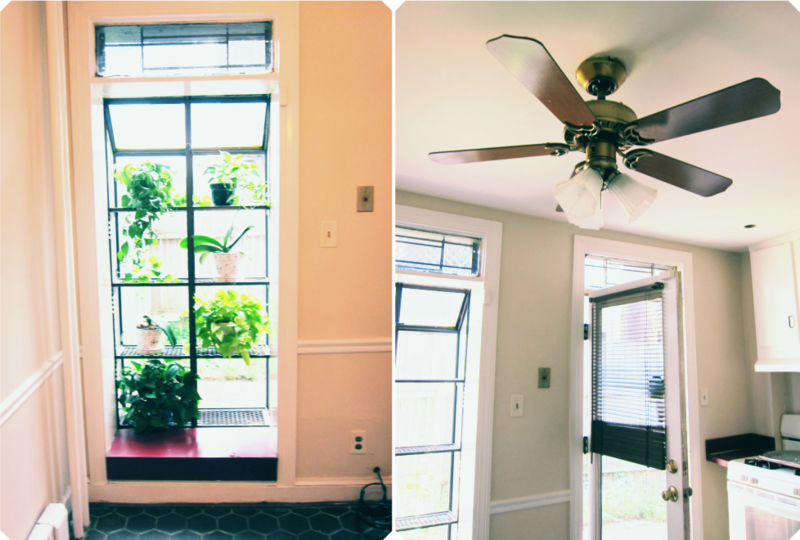 the worlds most awesome window, which we are thinking about getting rid of. mas hates it, i love it, it's a constant battle. i think he's winning. but if we do get rid of it, where will our kitchen aid and deep fryer go? hmmmm, it's tricky this small kitchen thing. lower cabinets and countertops removed. sink, fridge, stove, removed. upper cabinet doors removed. i really, REALLY wanted to toss them completely. 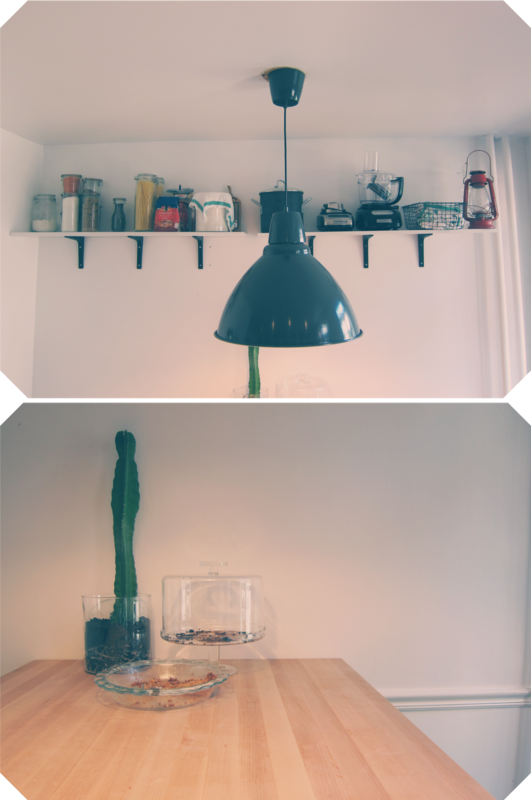 i really, REALLY wanted to replace them with very cool wooden shelves. but you know what? if we had taken down those cabinets the walls would have crumbled and we would have been forced to build new walls. we did not have a budget to build new walls. so, alas, the cabinets stay. for now. maybe one day, when we end up getting rid of the back wall with the door and the window, maybe then we will run the risk of taking down those cabinets. but honestly it scares the hell out me. so maybe not. goodbye ceiling fan, hello light fixture. we wanted two of these hanging, but we have neither the space nor the electrical capacity. whatever. one is fine. also, shelves. we did get a couple of shelves and for that i am happy. oh and then island, we built an entire island. that big empty space under the ceiling fan, it's quite useful these days. we eat there, i work there, sometimes frances even sleeps under there. it's great. 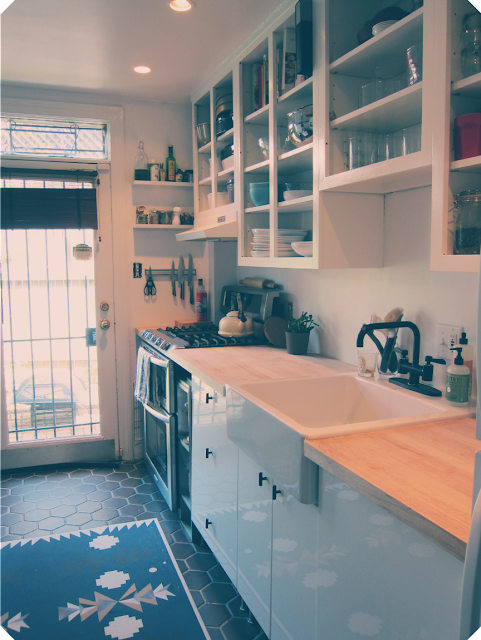 also it increases the countertop space by about 1000%. and did you see the living things? 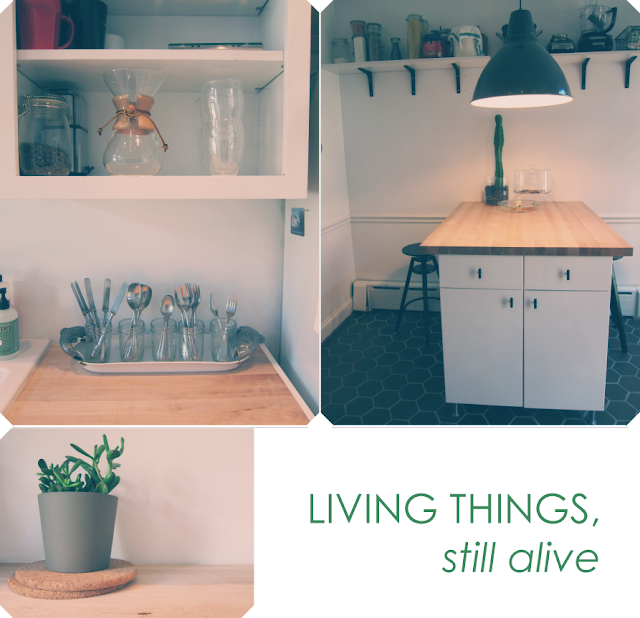 a few wonderful living things are living in our kitchen. it's been a while and they've not died yet. one point for me. my kitchen needs shelves and an island. 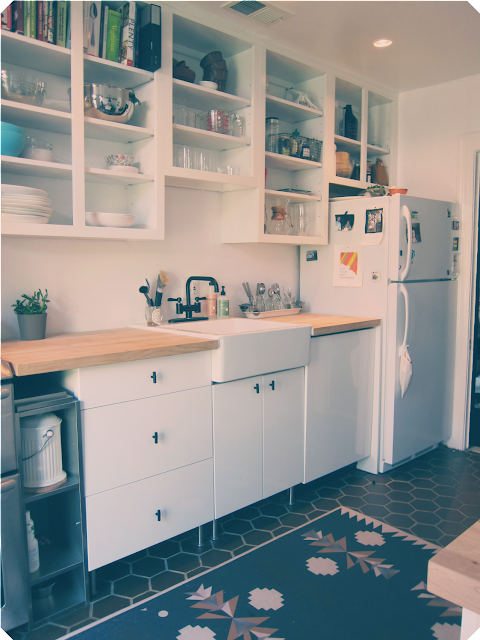 i love the rug, wooden counters, apron sink and pendant! way to go! I think taking the doors off the cabinets was super smart! They look great. And not having the wall collapse is a huge bonus. smashing. when my brother finally buys a house i'm going to strongly suggest he hire you to make it look amazing. if you aren't ok with that, sorry, it's going to happen anyway. It looks amazing. I love the light in the room and the light fitting too. your stovetop is killer. the rug? amazing. and that tile floor... came that way? i kind of love it. way to go. DUDE. It looks amazing! And for the record, I *love* the window. But I also love the idea of huge sliding doors. lookin' awesome! love love your honeycomb floors. I hear you on the needing to vomit while cleaning a kitchen that someone obviously hated due to the lack of "love" it ever had...ick. Also, with your light...how you wanted two? This is what I did...I have zero space to add new light fixtures in our kitchen. It's all 100% paneling, and no real space behind it for wires. Anyways, I installed some of the ikea sanda track lighting. They have modules where you can convert any lamp into a hardwire track light...and I believe it supports up to 400watts total. So I had one hole over the sink, and with this lighting I was able to extend clear down to the stove, and have four lights, as opposed to just one dinky one. It worked great! If you want, I can definitely sent you a picture. Maybe we could talk about that rug, for I wish to snuggle it. i'm in love with your house updates. also, i can't wait to hopefully SEE it next month? MAYBE? I love a good "before" and "after" post. Looks SO good! Wow...looks awesome! You did a great job! look the open cabinets and LOVE that sink! lovely "after" pics.